Kafie 1901 Cigars is a boutique brand, known for its Honduran origins and a focus on quality over quantity. This is highly evident with the company's sophomore release, Kafie 1901 Connecticut, a special blend that was under development for nearly a year before going into production. Kafie 1901 Connecticut is crafted at the esteemed Tabacalera Puros Aliados factory in Danlí, Honduras, where the cigars are rolled under the watchful eyes of the Reyes family. 1901 Connecticut features a diverse, multinational blend of tobaccos from four countries, including a proprietary binder that has been harvested from the Reyes family's own farms in Honduras. 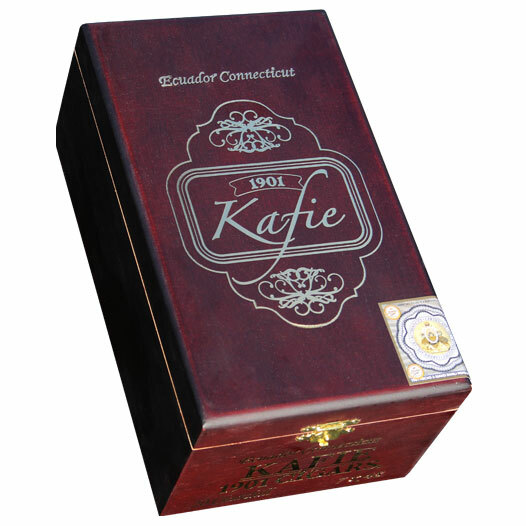 Specifically, Kafie 1901 Connecticut uses Dominican and Nicaraguan fillers, the aforementioned Honduran binder, and a golden-hued, shade-grown Connecticut wrapper from Ecuador. The resulting blend is highly sophisticated, offering tremendous balance and a nuanced, creamy profile. With a mild/medium body, flavors range from salted butter and light spices, to sweeter flavors of vanilla, nougat, and pastry dough.